Hey all, welcome back from the long weekend. I hope everybody had many days of eating too much, relaxing, and spending time with family. Ours included all of that, and also, one of the best parts about Thanksgiving weekend, breaking out the holiday decor. Yesterday I drug all of the Christmas bins out of the attic, put our tree up, and started to assemble our little winter wonderland. 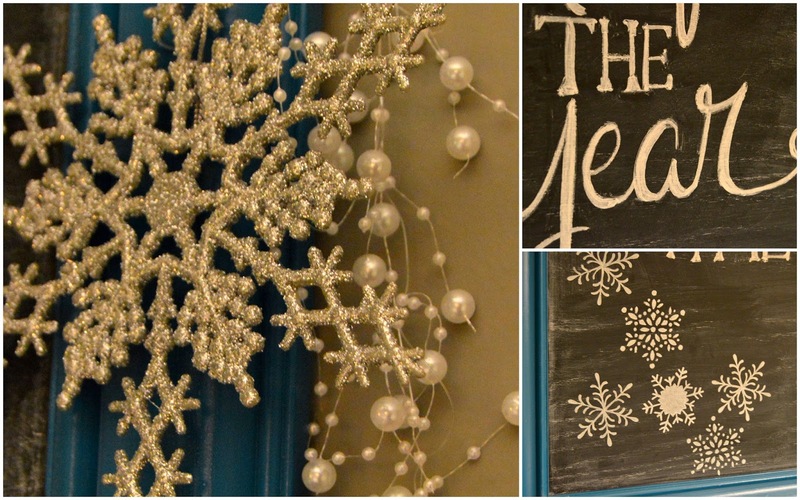 There is still plenty left to do, but one project I did tackle last night was our holiday chalkboard. I made this chalkboard a few years ago out of a poster frame, that I spray painted, and a piece of plywood covered in several coats of chalkboard paint, I love that stuff! 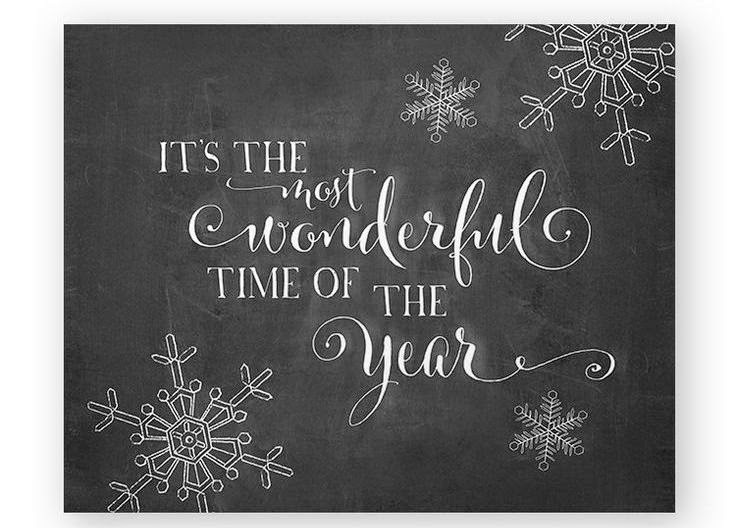 Now I'm no expertise, aka my chalkboard is far from perfect, but I thought I would share today the simple steps in order to create your own holiday (or really any season) chalkboard art. This is the method I use to pretend that I am still a little bit creative, and not just tracing, not that there is anything wrong with that, because I do that too! First off you need to find an inspiration image. Pinterest is great for this, just type in whatever you are looking for followed by the word chalkboard, you will have tons to choose from. This is the inspiration image I used for my chalk board. Next gather your supplies, you need your image handy, I just used my i pad, but you could print it out, have it on your phone, whatever works for you. A ruler, and some white chalk. Start with drawing in your guidelines. Mark the approximate center, and also mark the different lines and heights of the fonts you plan to create. Don't worry these will disappear later. Then, take your chalk and use your guidelines and start creating your letters. I like to start in the center and work my way out. Instead of thinking that I am writing words I like to look at the shapes and flow of the lines, it helps me, and then I just take it piece by piece. I look at were the words line up with each other to try to keep it to scale, but nothing ever turns out perfectly. And don't worry about making a mistake, that is the beauty of chalk. If it doesn't look quite right, try it again. Above I have everything 'penciled' in. You can still see my guidelines, and you can even see in the middle of wonderful where I had a little redo on the d and e. Now you need a little cup of water and q-tips. Many more q-tips then I have pictured here. The q-tips and water are your eraser. Dip one in and start erasing your guidelines and any mistakes you made a long the way. Now that you have finished your template, it's time to go back in with wet chalk. Take that piece of chalk and keep your cup of water in hand. Dunk it in, and keep it wet as you go along. Using your inspiration image go back along all the letter adding thickness and contrast, wings, or lines, whatever makes it stand apart. The chalk will look really light when wet, but once it dries it will look a very rich white. Here I had finished all of my letter styling if you will, and you can see how the top is very vibrant because it is dry, but the bottom is still light because it hadn't finished drying yet. Then go back in with your eraser q-tips again and clean up any little spots that aren't quite how you'd like them to be. Now add any embellishments you would like. I tried my hand at a few free hand snowflakes, but frankly they looked terrible. 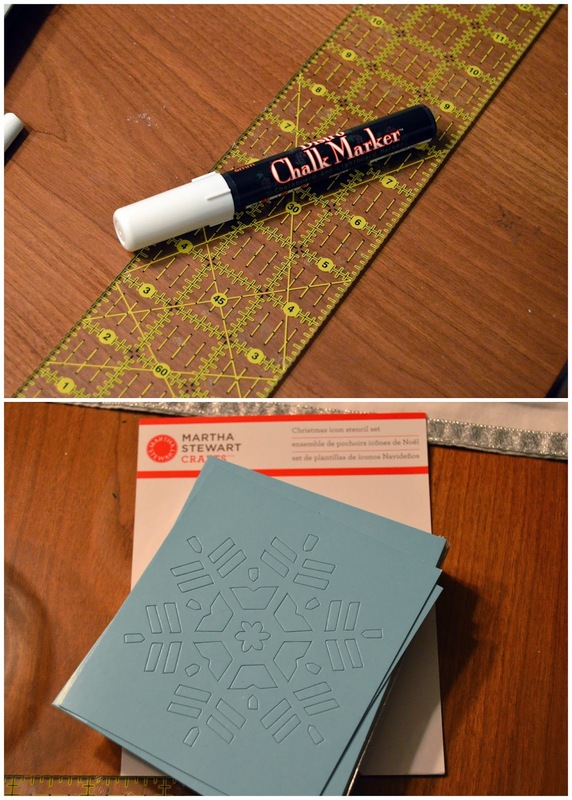 So I busted out my chalk pen and some holiday stencils I had picked up at JoAnns. I just used a piece of tape, stuck the stencils where I wanted, and filled them in. And then voila, you have your finished product! Now it's time to get to work on the rest of the holiday decor, have you started yet?! I love, love, LOVE this! Thank you for the thorough tutorial - I definitely plan to have some sort of chalkboard in the new house, and this will definitely help me out. You have such beautiful handwriting! So impressed girl!!! Definitely saving this one! Thanks girl! The key it to think of it as shapes and pictures, versus handwriting, if I think handwriting it looks terrible! I would love to take a class someday on how to actually write like that! Glad you liked it Jen! This is AWESOME! I'm so impressed! :) Thanks so much, I love crafty stuff like this - I just wish there was more time in the day to do it!